OCE's fall On-campus Interview Week will take place from October 15th-19th with deadlines happening by the end of September/early October. Arcadia students may review positions and submit resumes through Handshake. Students: Review participating employers and apply for positions. Please watch the video below to learn more about On-Campus Interview sign-up and instructions. Prior to watching the video, please click on the "Sign In" button at the top right corner of the page. From the drop down menu, select "Canvas" and then sign in with your username and password. 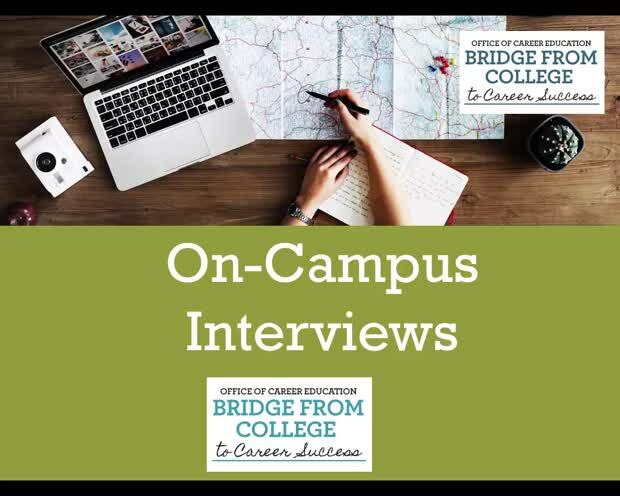 All students participating in the OCE's On-Campus Interview Program are required to watch this video and take the quiz at the conclusion of the video. Questions? Contact Assistant Director Mia Wittels at wittelsm@arcadia.edu. Click Here for important details on the Cancellation Policy, No-Show Policy, and Business Etiquette!